Ficus pumila is native to China, Vietnam, and Japan. It is a root-clinging, evergreen perennial. It clings by aerial roots along the stem and has leaves that are small, bright green and heart-shaped. Creeping Fig will grow in moderate shade or sun. 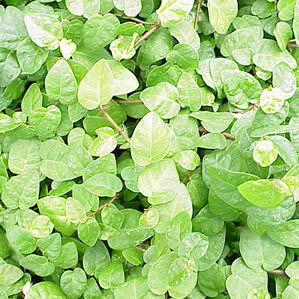 This variety has solid green leaves, this is a great plant if you have a wall that is bare. The Creeping Fig will cling to surfaces allowing one to hide an unsightly wall or to just soften the architecture. This plant also works well as an indoor potted plant, as long as it has a sunny spot to sit in.